In Tibet there are four main Buddhist schools and several sub-schools. Each has its own spiritual leaders, some of whom are reincarnated lamas and others who inherit their position. In the case of reincarnated spiritual leaders, their recognition depends entirely on the traditions and practices of each lineage. The four schools respect one another’s recognition processes. In connection with the recognition of reincarnated lamas, two procedural practices have developed over the centuries. With rare exceptions, lineages have closely observed these two traditions or practices. According to the first operational principle, schools do not need approval from the government of Tibet or from HH Dalai Lama to recognize a reincarnated lama or leader, unless the government has instituted a special legal ban against recognizing a particular lineage of spiritual leaders. Such a ban is imposed for political, not spiritual, reasons. This is extremely rare in Tibetan history. Before a reincarnation of a lama in a banned lineage can be made official, it is necessary to seek government permission to revoke the ban. The second important traditional practice is that reincarnated lamas must first be recognized by their own lineage’s spiritual head or other senior lama with the authority to identify reincarnations. In addition, the administration of the deceased reincarnate must acknowledge or accept the new reincarnation. The following famous 20th-century example illustrates how the second traditional procedure works. After the 9th Panchen Lama passed away in 1937, the current His Holiness 14th Dalai Lama recognized one reincarnation. This act is correct traditionally because the Panchen Lama is part of the Gelugpa lineage which His Holiness 14th Dalai Lama heads. However, one more step is required before the recognized reincarnation can be officially enthroned. The Panchen administration did not accept His Holiness Dalai Lama’s recognition. Instead, the spiritual heir of Panchen Lama at his own monastery, Tashi Lhunpo, recognized Lobsang Chokyi Gyaltsen as the 10th Panchen Lama. He was enthroned as the seat holder and held this position until he passed away in 1989. The lama that His Holiness Dalai Lama recognized as the 10th Panchen Lama never became the official Panchen Lama and is known as the Panchen wotrul (“suitable Panchen”). He is still alive in England. The Karma Kagyu School follows the same practice as the Gelugpa, but its independent tradition of recognizing reincarnated lamas is stronger and older than the Gelugpa’s. For 800 years, the Karmapas and Shamarpas have alternatively identified each other as spiritual heads of the Karma Kagyu. Sometimes they recognize each other by their supernatural minds and other times according to instructions one of them has left behind. In 1988 the 14th Shamarpa recognized Trinley Thaye Dorje as the 17thKarmapa. To complete the recognition process, the administration of the late 16th Gyalwa Karmapa accepted the recognition of Trinley Thaye Dorje. Therefore, according to longstanding tradition, Trinley Thaye Dorje’s recognition as Karmapa is completely authentic and proper. The same cannot be said for Ogyen Trinley Dorje’s recognition. We respect Ogyen Trinley Dorje as one who can hold the name Karmapa out of deference to His Holiness 14th Dalai Lama, even though previous Karmapa incarnations have never been recognized by the Dalai Lama or other Gelugpa lamas. His Holiness 14th Dalai Lama accepted Ogyen Trinley Dorje’s recognition by Tai Situ Rinpoche and Government of China jointly. Nevertheless, Ogyen Trinley Dorje cannot be considered the official, authentic Karmapa because the administration of the 16th Gyalwa Karmapa has never accepted him. 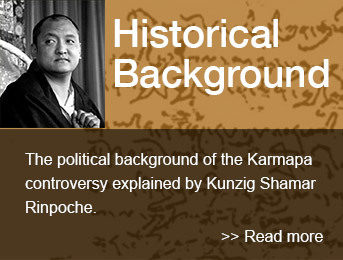 At various points in history, the Karmapa and Dalai Lama have been rivals among the lineages. They have not always enjoyed a spiritual connection or friendship. His Holiness Dalai Lama justifiably is very famous and has millions of followers. Unfortunately, they disregard the traditional and legitimate rights of the Karmapa’s administration to determine the authentic reincarnation and support Ogyen Trinley as the official, true Karmapa because of His Holiness Dalai Lama’s prestige. Trinley Thaye Dorje does not enjoy the same public relations advantage that His Holiness Dalai Lama’s support gives Ogyen Trinley. Nevertheless, as the Karma Kagyu spiritual leader who has been enthroned according to the traditionally orthodox procedure, he has won the trust and approval of legions of followers around the world. The bullying politics of individuals in Ogyen Trinley’s camp cannot obscure the authenticity and legitimacy of Trinley Thaye Dorje as the 17th Gyalwa Karmapa. Regarding the recognition of Ogyen Trinley by Situ Rinpoche, his status does not match Shamarpa’s historical position or role in the recognition process. This said, previous Situ incarnations do have some authority and precedent as one of the lamas to recognize Karmapa, but this has occurred mostly in the absence of Shamarpa. We might have accepted the recognition of Ogyen Trinley by Situ Rinpoche if he had not embroiled the process in politics or taken questionable steps in the recognition process. We have three reasons for not accepting Situ Rinpoche’s candidate. Situ recognized a child of a nun in his monastery in India as the Karmapa, but the search committee rejected this child, whereupon Situ switched to recognizing Ogyen Trinley in China and enlisted the help of the Chinese government in this process. When Situ went to the Rumtek monastery to announce his nominee Ogyen Trinley as Karmapa, he did so not in the peaceful spirit of a Buddhist teacher, but in the role of a tyrant who uses force to compel compliance. The attacks on the monks at the monastery by his gang forced the Rumtek administration to seek protection from the Indian government. Situ produced a prediction letter regarding his choice for the 17th Karmapa. This document was obviously forged as it is Situ’s own handwriting. He refused to allow forensic scientists to examine the document when the Karmapa administration so demanded. Regarding the so-called Sherpa Karmapa, he is merely a Sherpa boy who claims he is Karmapa. Many Sherpa people in Sikkim support him. However, his claim to the spiritual title of Karmapa is not at all legitimate according to the Karma Kagyu’s long tradition of recognizing reincarnated lamas. Claimants like Sherpa Karmapa inevitably surface from time to time. For example, a very rich Chinese monk in Taiwan by the name of Hai Tao claims he is one of the emanations of Karmapa, and he has even announced that Thrangu Rinpoche recognized him and Ogyen Trinley has accepted this. He, Ogyen Trinley, and Thrangu Rinpoche are supporting one another in public broadcasts through their own TV channel in Taiwan and are collecting large sums of donations.